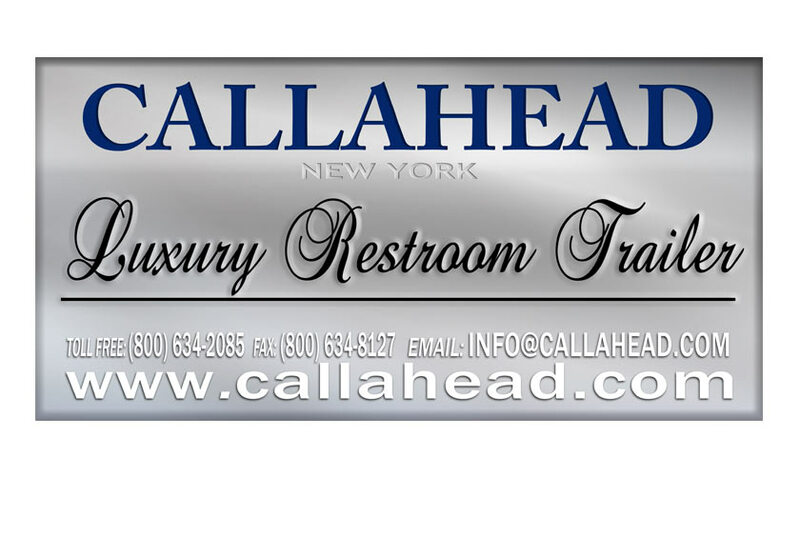 Each entry door displays our signature signage, "CALLAHEAD Luxury Restroom Trailers", to let your guests know you provided them with the best restroom facilities. The restrooms sophisticated artwork consists of paintings of lovely gardens and landscapes in gold Michaelangelo style frames. Each piece of art was carefully selected and custom framed for the WESTCHESTER. 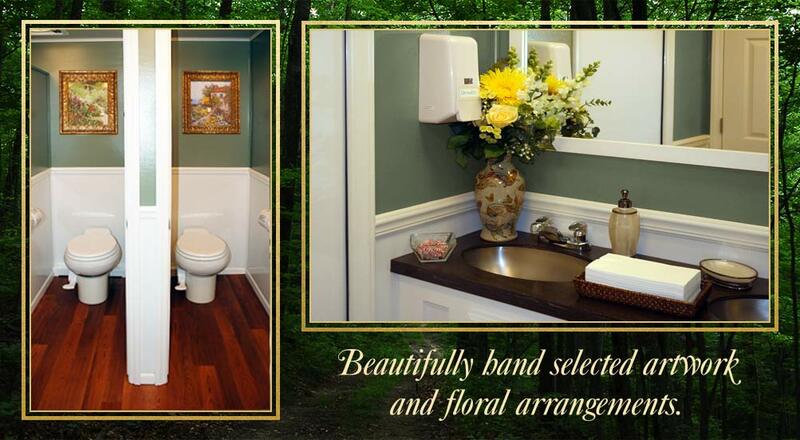 The floral arrangements, also custom designed, add to the restroom trailers sophisticated setting. 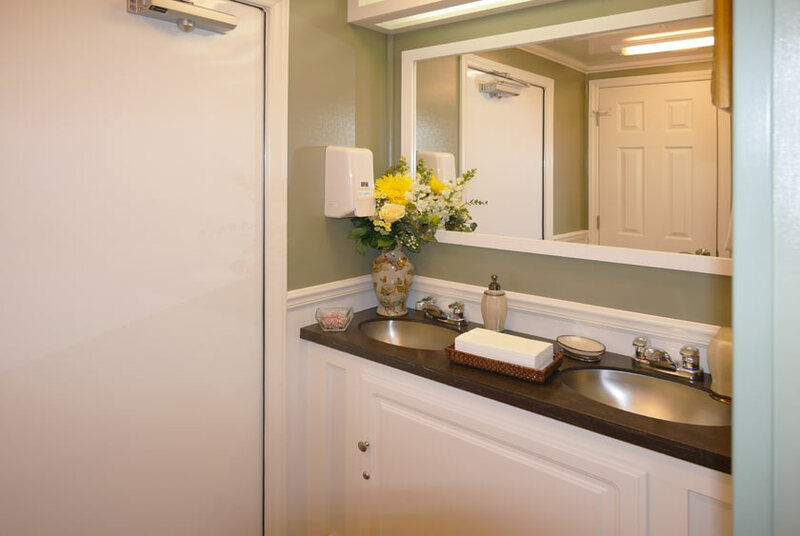 Decorative antibacterial soap dispensers, filled tissue holders, hand towel trays, and filled candy dishes are also provided to deliver a VIP restroom experience. As an added feature, the WESTCHESTER includes an Exlerator electric hand dryer and built-in soap dispensers in the vanity area. A thermostat heat and air conditioning system will provide a comfortable temperature inside the restroom any time of year. There is also a surround sound music and speaker system for all to enjoy. 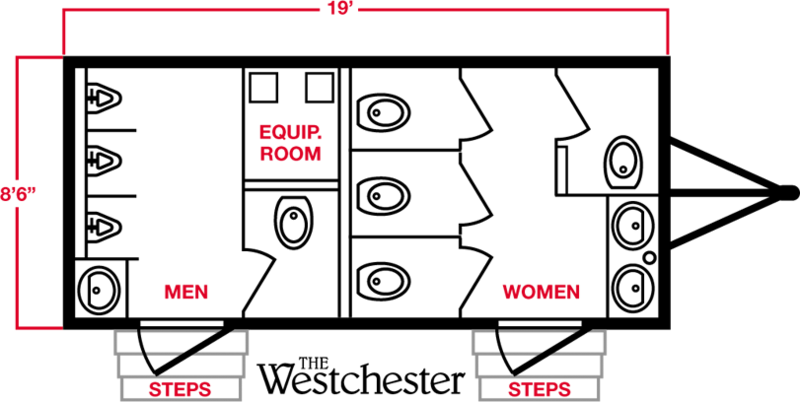 The women's restroom facilities include four private bathroom stalls with floor to ceiling solid wood locking doors. The door handle and hardware is all brushed nickel finish. Every large private stall includes a hands-free porcelain flush toilet, dual brushed nickel toilet paper dispenser, and trash receptacle. 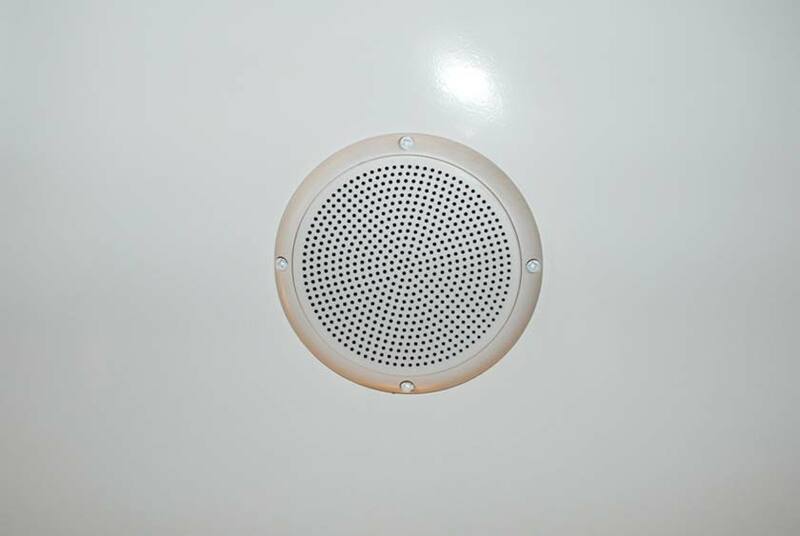 Each bathroom stall has a personal ceiling vent to offer additional ventilation when desired. 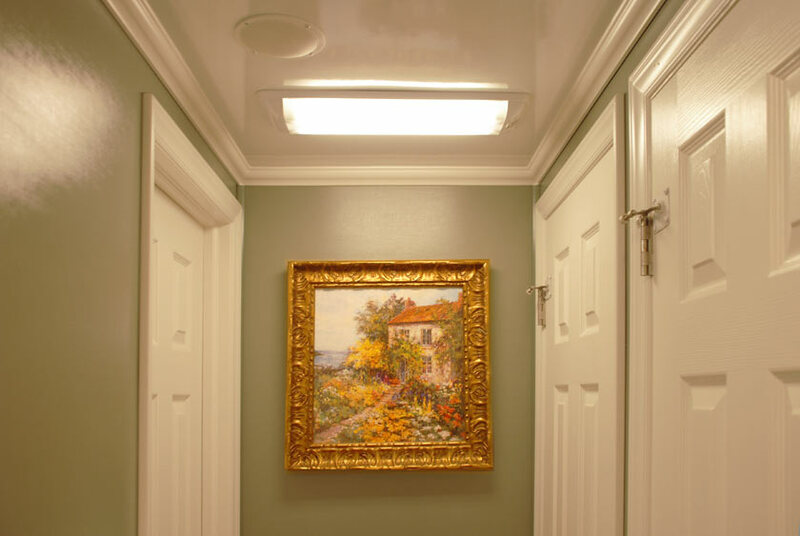 A framed masterpiece in each private stall adds to the restrooms timeless charm. The men's restroom includes all the deluxe amenities and décor just as the women's. They have one private bathroom stall that includes all the elements inside the women's stalls. 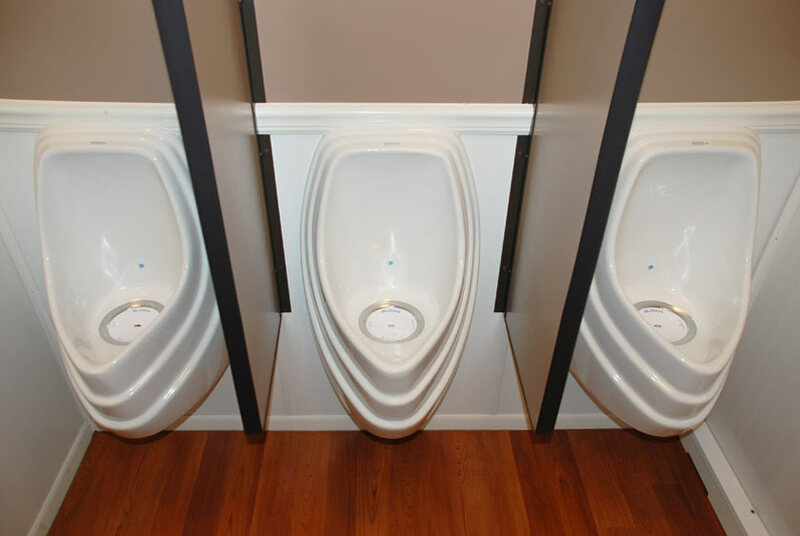 Additionally, the men's restroom is equipped with three waterless porcelain urinals with matching privacy dividers. 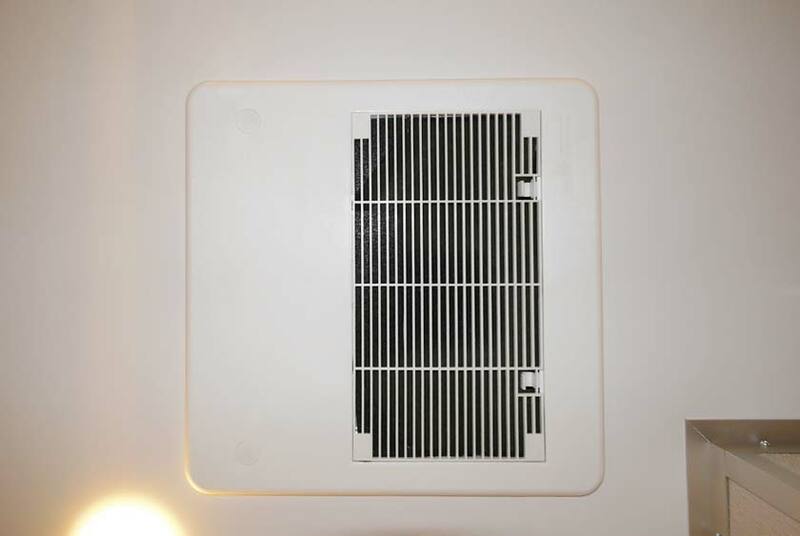 A unique filter system for the WESTCHESTER ensures the urinals operate completely odor-free. 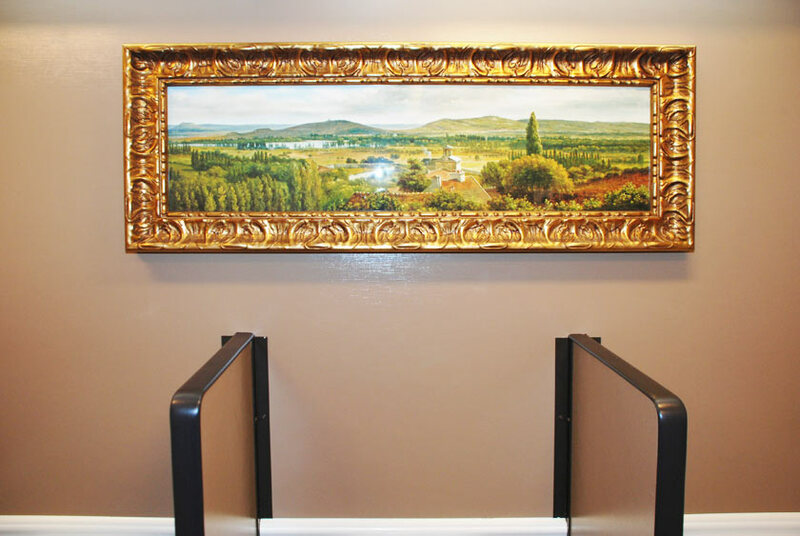 Above the urinals hangs the extraordinary painting, "Panoramic View of the Ile-De-France, C. 1830" by French artist Theodore Rousseau to add to the countryside theme decorated throughout the restroom. 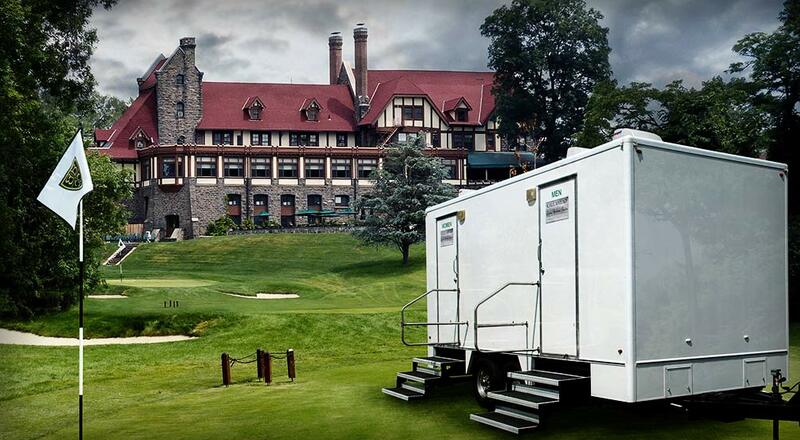 A CALLAHEAD professional uniformed delivery technician will deliver the WESTCHESTER RESTROOM TRAILER to your location. Set-up will take approximately 30-minutes before it is ready for use. 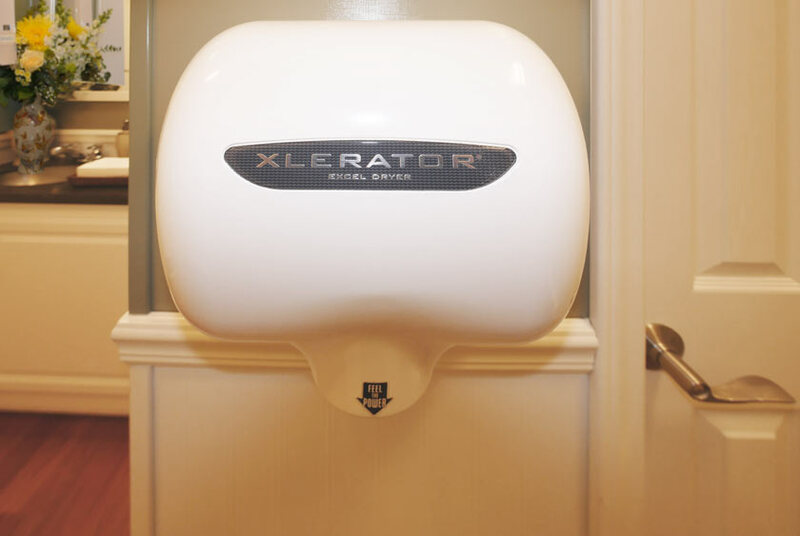 A professional uniformed restroom attendant is also available to keep your restroom in pristine condition throughout your entire event. CALLAHEAD only uses hospital grade cleaners and disinfectants to make certain every restroom has the utmost sanitary conditions. The WESTCHESTER is designed to provide sanitary restroom facilities for your guests while also supplying luxuries and comforts of restrooms inside five-star restaurants. In business since 1976, only CALLAHEAD has the decades of experience and unsurpassed dedication to providing the highest quality equipment and service to our customers. 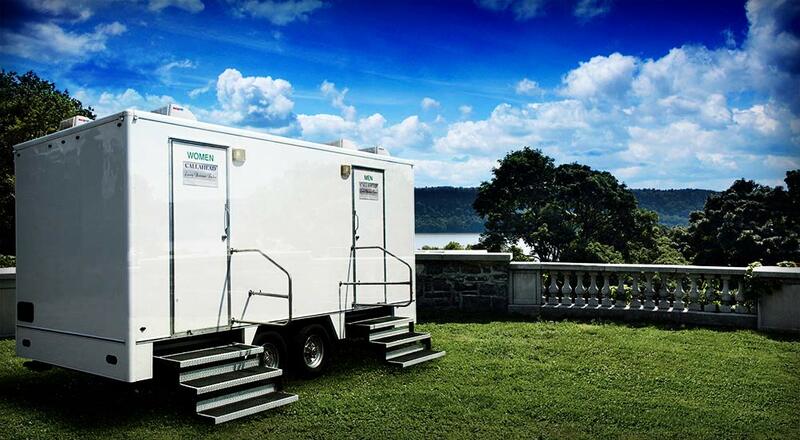 The WESTCHESTER LUXURY RESTROOM TRAILER is available for delivery throughout all of New York City's five boroughs of Manhattan, Queens, Brooklyn, Staten Island, and the Bronx as well as Westchester County, and Nassau and Suffolk Counties to Montauk Point. Both the women's and men's restrooms have white wood wainscoting that goes up to the 3-foot height. 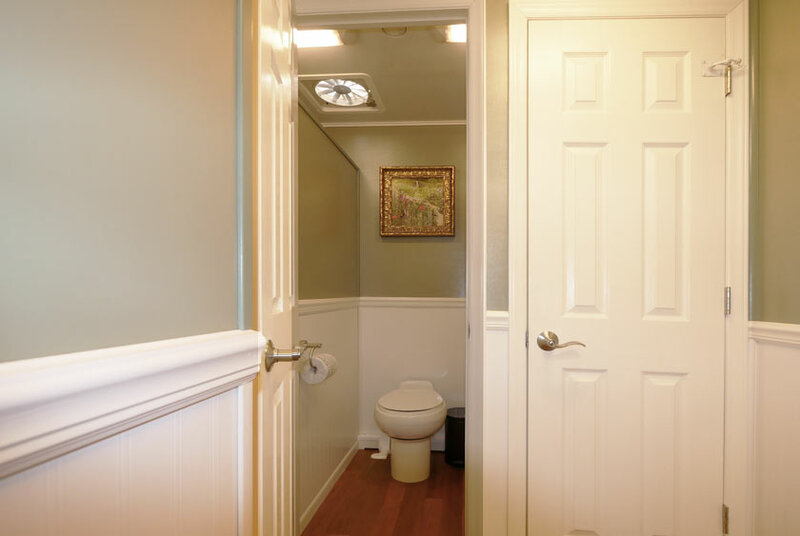 Base moldings, chair rail moldings, crown moldings and casement moldings extends all through the restroom trailer. 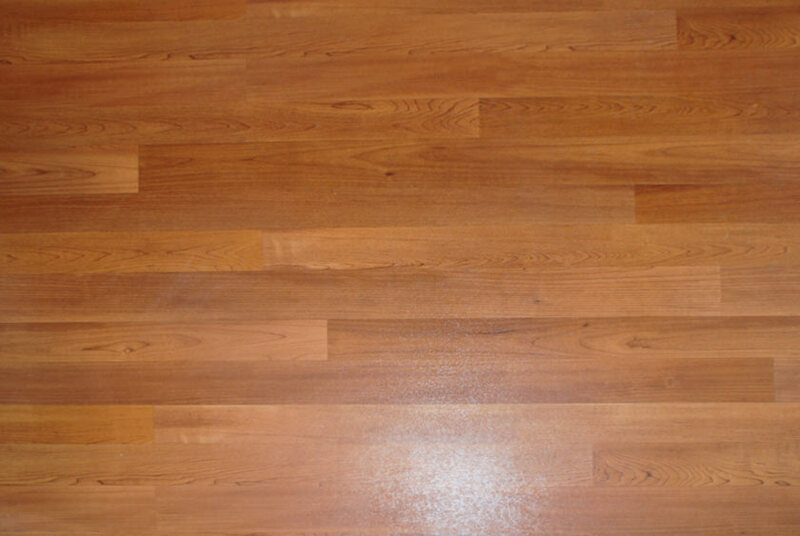 The wide-planked wood Armstrong floor adds warmth to the rich country club setting. 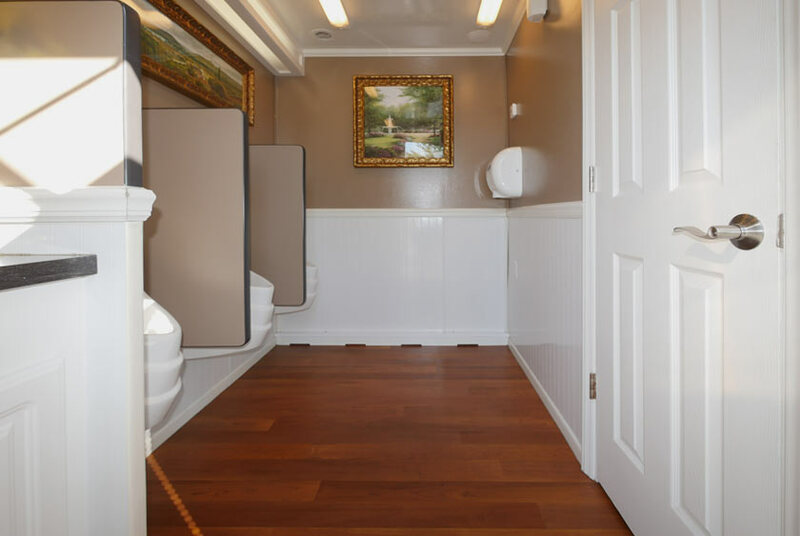 The gorgeous replica paintings in Renaissance gold frames bring together the eclectic design of the WESTCHESTER RESTROOM TRAILER. The vanity Corian countertops have steel sink basins with automatic faucets. A built-in trash receptacle within the vanity countertop will keep the bathroom and sink area clean. The restroom is well-stocked with an abundance of amenities. 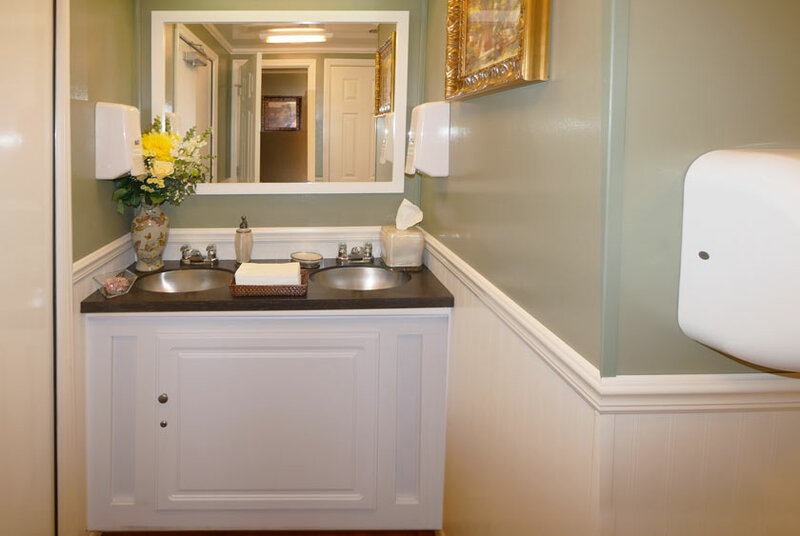 Stylish antibacterial soap dispensers, hand towels, designer tissue holder and filled candy dish are all provided. 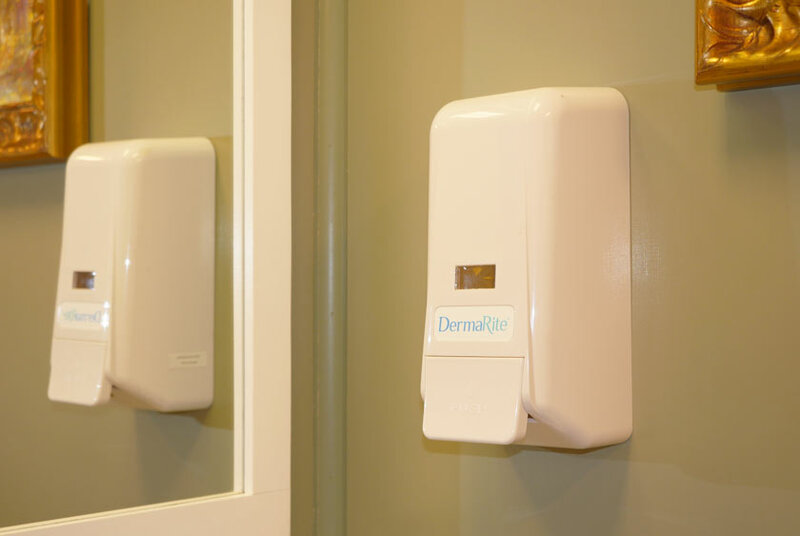 Additionally, built-in soap dispensers and electric hand dryers are provided in both restrooms. 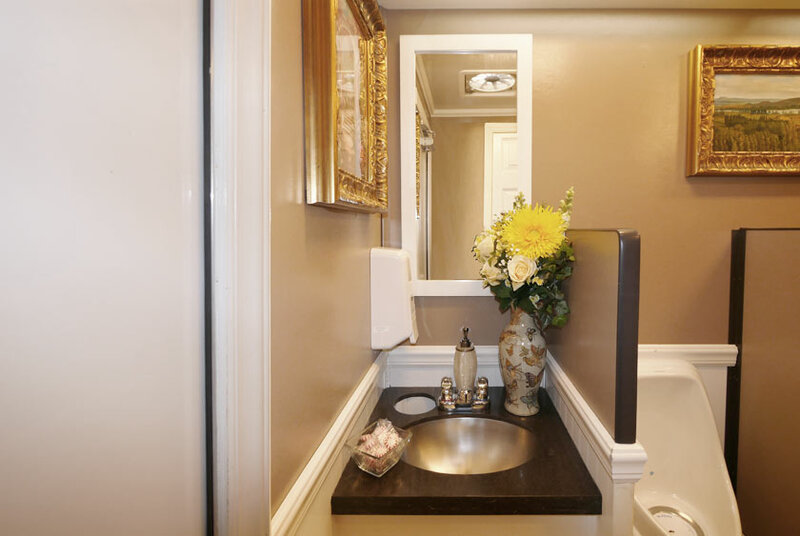 The full-sized wood trim vanity mirror is well-appointed above the sink area while a beautiful floral arrangement enriches the restroom's setting. 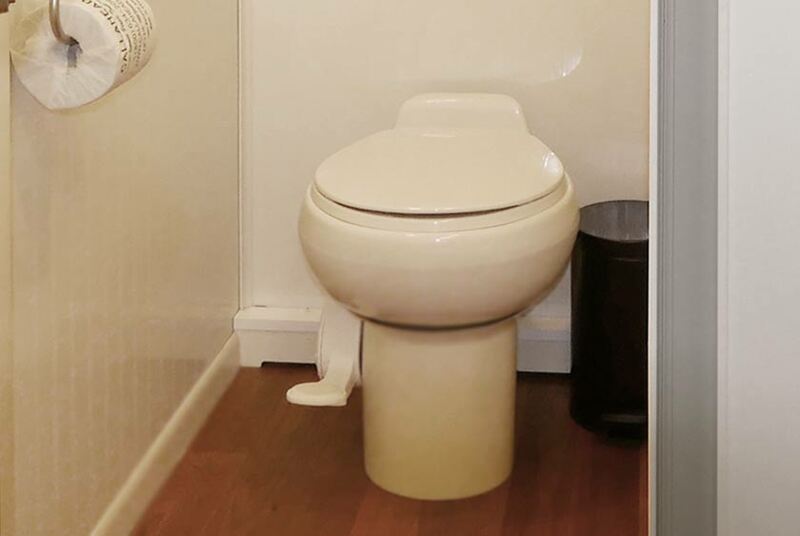 There is even extra storage space beneath the vanity sink for extra supplies. 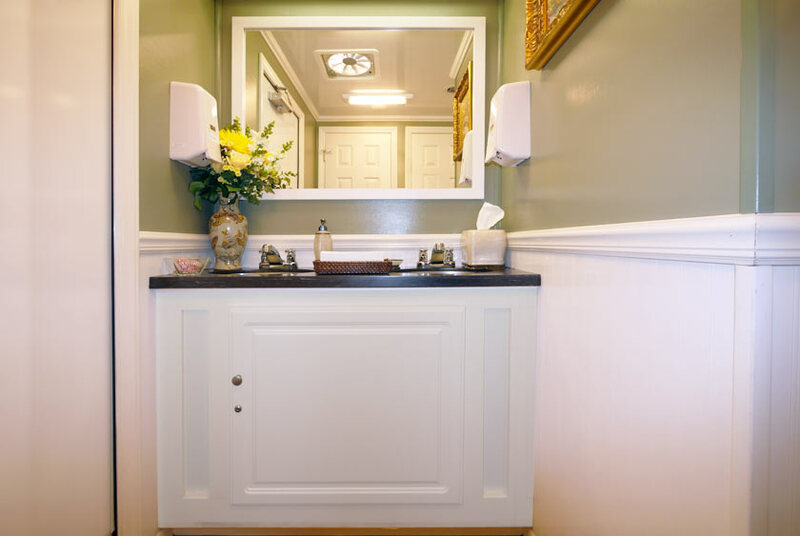 The WESTCHESTER LUXURY RESTROOM TRAILER has a Dometic thermostat heat and air conditioning system installed to keep the bathroom comfortable on hot summer days and cold winter nights. 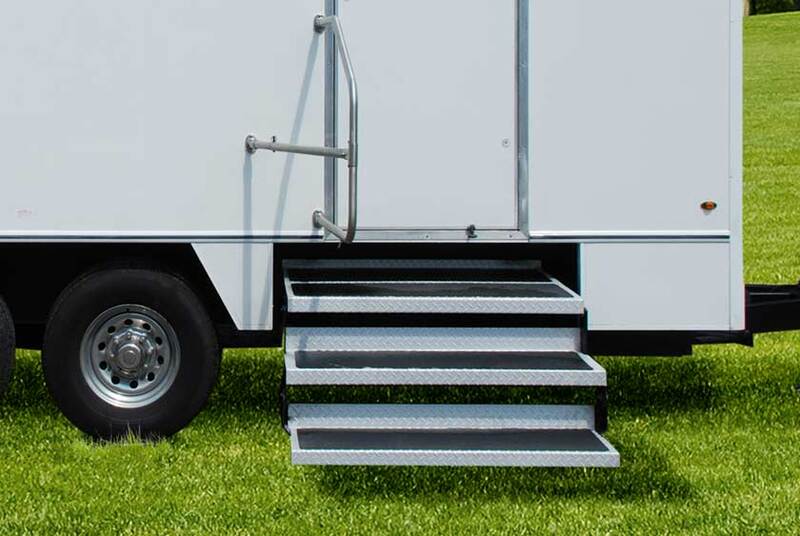 Electricity for the restroom trailer runs from a standard 110-volt outlet or generator. For more information about the WESTCHESTER LUXURY RESTROOM TRAILER or all of CALLAHEAD's innovative equipment, including special event portable toilets, worksite portable toilets, construction site restroom trailers, porcelain toilet systems for office trailers, security guard booths, holding tanks, fresh water delivery, commercial portable sinks, portable hand washing sinks, antibacterial and hand sanitizing dispensers, long-term or short-term portable toilet rentals, portable shower rentals, and portable storage shed rentals, please contact a CALLAHEAD specialists at 800-634-2085 or visit our website for full photos, videos and full details of our equipment to accommodate all your portable sanitation needs at www.callahead.com. 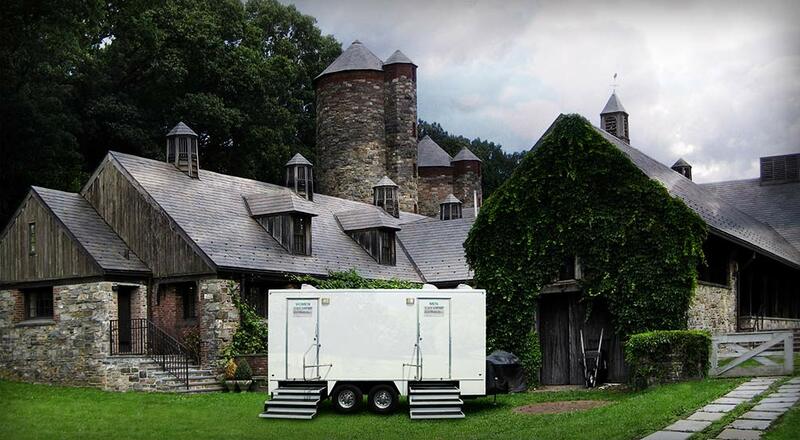 The WESTCHESTER is CALLAHEAD's 24-foot luxury restroom trailer for short-term rental and special events. 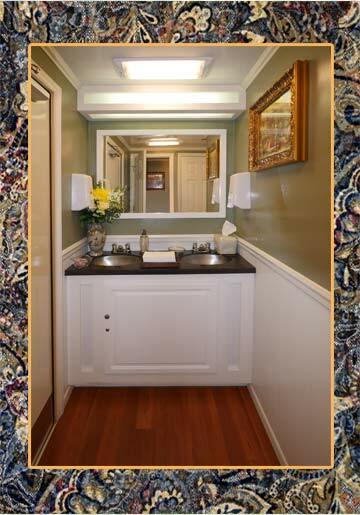 This superior 8-station luxury restroom will provide your guests with all the comforts and privacy of a home bathroom, in addition to the luxury amenities supplied in ritzy hotels and catering halls. 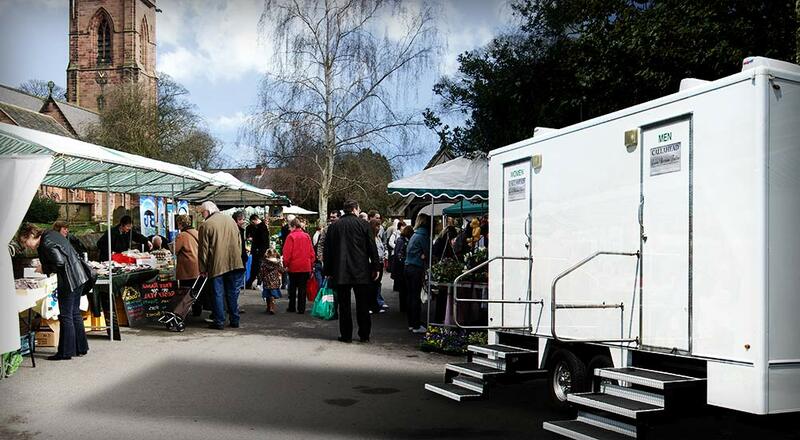 All in one of our finest portable restroom trailers! The highly sanitized separate men's and women's restroom has an elegant country décor. 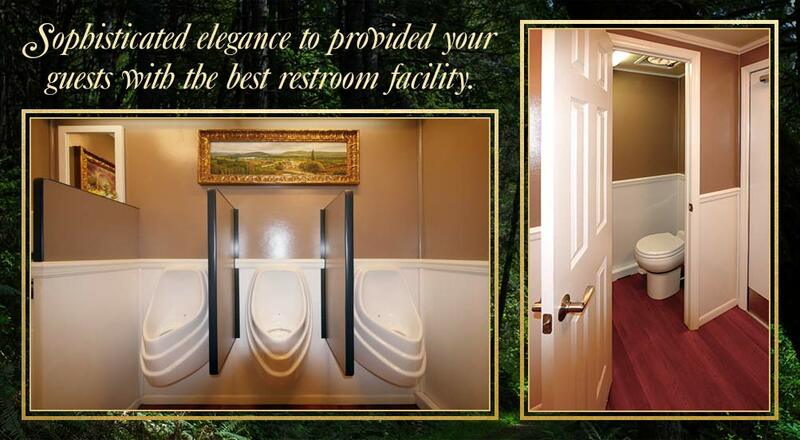 The WESTCHESTER'S interior design and luxurious elements, guarantee every guest will enjoy their trip to the restroom. 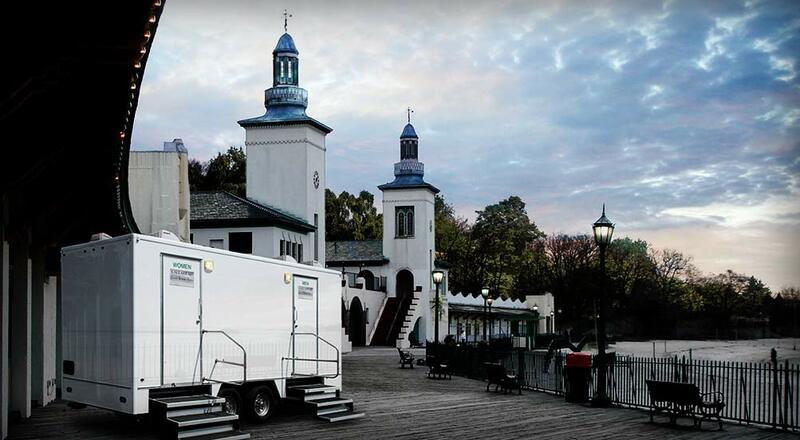 This is an excellent bathroom trailer rental for any social event including galas, engagement parties, graduations, corporate events and weddings. 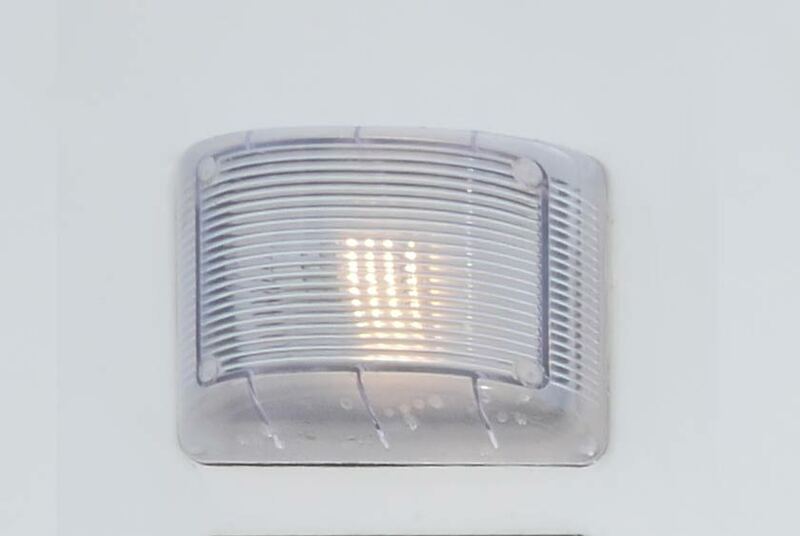 The WESTCHESTER LUXURY RESTROOM TRAILER has a bright white exterior with outdoor lighting for evening events. You enter the women's and men's restrooms utilizing the wide floating staircase with slip-proof surface. The staircases aluminum handrails have a threepoint support system for safety and strength.